Mustapha Babagana, 25-year-old commercial motorcyclist in Lagos was on Wednesday arraigned in an Oshodi Magistrates’ Court, Lagos for allegedly assaulting a police woman. The accused who is from Ilupeju, is said to have committed the offence on October18 at Town Planning Way, Ilupeju. Cpl. Kehinde Olatunde, the prosecutor, told the court that Babgana assaulted one police woman, Sgt Ekpeyong Eyi, by throwing her off his motorcycle. Olatunde said that the sergeant was on official duty with her team when the incident occurred. According to him, the police were arresting motorcyclists plying the Town Planning Way, Ilupeju to Oshodi in enforcement of the new Lagos State Traffic Law that restricted their movement from the particular road. 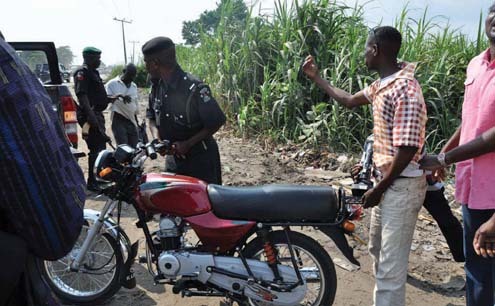 “As the road has been declared a no-go-area for motorcycle operators by the Lagos State Government, the sergeant arrested the accused and sat on the passenger sit of the bike. And immediately, Babagana raised the bike’s front wheel up and the female sergeant fell to the road,” the prosecutor said. He said that the accused then sped off but was later arrested with the effort of the other policemen in the team. Babagana, however, pleaded not guilty to the charge. The prosecutor said that the offence committed contravened Section 172 of the Criminal Code, Laws of Lagos State 2011. Magistrate M. R. Osho-Adebiyi granted the accused bail in the sum of N50,000, with one surety in like sum, and adjourned the case to November 11 for trial.